Deb's Cup of Tea: Huh? In my last work travels, I was around Madison, doing some post-inspections of buildings I had inspected way back in March. I finished and it was time for lunch. I just wanted something fast, as I could get back to the office, dump all my paperwork, download my photos and then go home. Ah, Hardee's. We don't have them in Chicagoland. I like their hot ham and cheese sandwich. I ate my lunch as I drove back to the office and left the garbage in the car to be added to my can as, at the time, we didn't have garbage pick up decided at the new office. I'm cleaning out my car when I get home and I look at the box which contained my sandwich. What does this even mean? Generally speaking, I "mean" to eat everything I consume. There must be some full ad campaign to which I'm not privy because Hardee's isn't in the Chicagoland area. Whomever thought this up must have been more than a few hot ham and cheeses to the wind. Does it inspire me to eat at Hardee's more? No. I eat where I eat because I want to, not because of some slogan. If anything, this is kind of insulting. 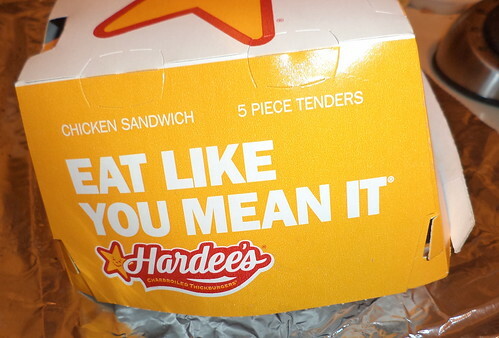 Hardee's wouldn't be the choice of someone on a restricted diet, but then, fast food isn't for them, probably. Still, in the desire to obtain my pennies in exchange for food, this doesn't inspire me to give them $4.69 for a sandwich.